I’ve blogged before about Theverymoodyhousehold attemtping to reduce our waste. Grimace is always inspired with new ways to help achieve the reduction, and this week is no different. Each day both he and I take a muesli bar to snack on at work – I know, I know, not the best snack food in terms of health and equally as terrible in environmental impact as each bar creates waste – being individually wrapped in a non-recyclable material. Each day that means we contribute to unnecessary landfill. Last night I found myself making Tuesday night’s dinner, so while I was waiting for the oven to do it’s thing, I remembered Grimace’s resolve to make our own muesli bars (he was incidentally out rescuing a poor guy who had his motorbike break down at the train station…Grimace being a knight in shining armour went to save the day *cough cough* van-that-can-take-said-broken-down-motorbike-to-shop-to-get-repaired and gain another happy customer). I have previously been quite a mad baker, but since the onset of child number 2, I’ve struggled to make time for it. Doing a little research (and I do quite literally mean little. 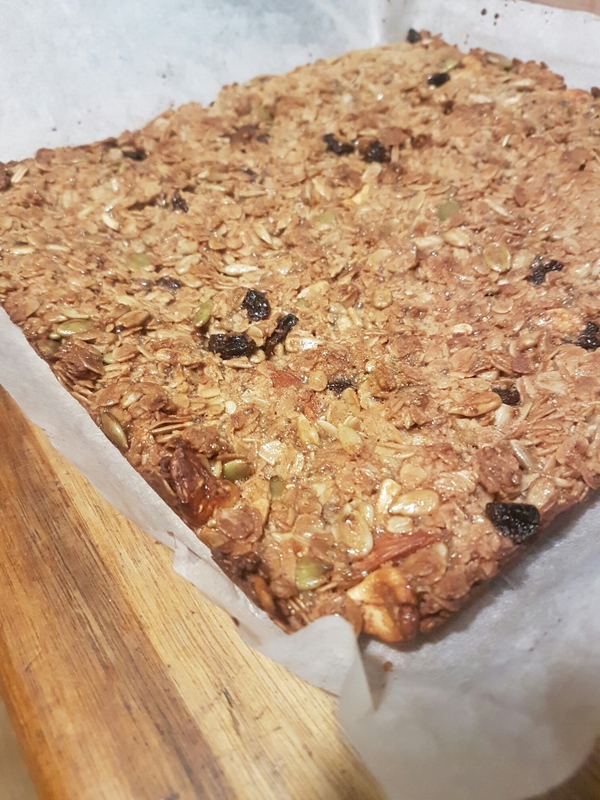 I went to one website), I found a recipe, altered it to meet my lazy requirements and smashed out some delicious bars – Grimace doesn’t eat chocolate (weird, I know) so I substituted a low-carb mix of nuts and dried fruit that we had in my overloaded pantry, added a whole heap more cinammon, and used only honey (no maple syrup). I also couldn’t be bothered cleaning the food processor, so kept all the nuts and fruit completely whole; I was a little worried the mix would be crumbly…it wasn’t! I was so proud pulling them out to eat today – home baked products always bring the goods, and in this case, there wasn’t any packaging to throw away. Anyway, if you want to play along at home, there are approximately one trillion websites out there that provide delicious and easy recipes, but I do really like One Handed Cooks – their recipes are always easy to make and REALLY easy to vary depending on what you have or don’t have in the cupboard/flavours your fam-bam prefers. What are some of your delicious snacks that you make up in bulk and freeze? I’m fast-forwarding 18 months when school lunches will be a thing for us, and thinking that if I can introduce good habits now, it won’t come as such a shock to provide all the school appropriate foods (nut-free, low sugar, blah blah blah), each day of the term.